This tent package includes (1) 20x20 High Peak tent, (32) Black folding chairs, and (4) 5' round tables!! 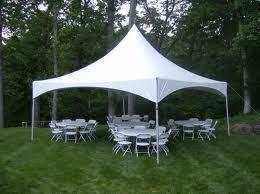 This Tent package provides 400sq.ft of nice dry shade covering partying area!! Also deletes having a center pole in tent!! **(High Peak Tents can be put on pavement) If on pavement please leave in comments.